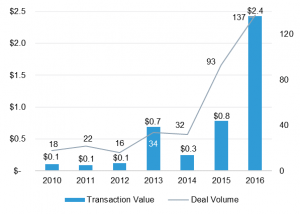 2016 was a record year in the IoT sector with a total of 127 transactions, reflecting a nearly 60% increase in transaction volume compared to 2015 and an unprecedented total disclosed transaction value of $39.9 billion. The biggest deal, responsible for a significant part of the jump in total disclosed value, was the acquisition of the U.K.-based chip maker ARM by the Japan’s Softbank for $31.4 billion in September 2016. Furthermore, Verizon Communications continued its strategy in the telematics industry by acquiring Dublin-based Fleetmatics Group, a provider of GPS fleet tracking solutions, for $2.4 billion at a 7.0x LTM revenue multiple in August 2016. 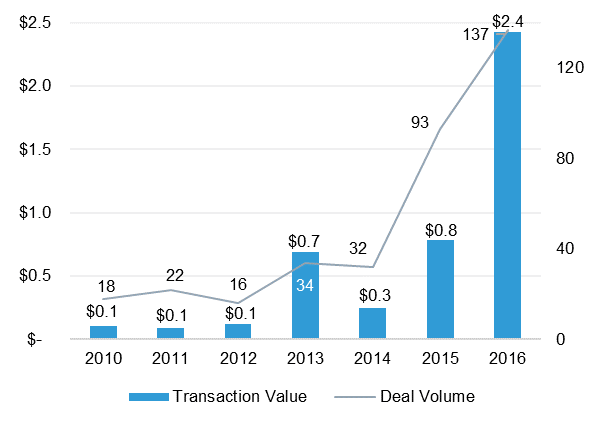 Other large deals include Sensus’ acquisition of Xylem, a leading provider of smart meters, network technologies and data analytics services for $1.7 billion and Cisco’s acquisition of Jasper Technologies for $1.4 billion (mentioned in my previous post). Private placements have also experienced a significant a jump in transaction volume and total dollars. The total of 137 transactions represented an increase of 47.3% over 2015 and total dollars invested increased 3.1x to over $2.4 billion, reflecting an increase in average transaction size from $9.7 million to $18.4 million. This performance is partly driven by Infineon’s fundraising of $935 million in debt financing in April and NavInfo’s fundraising of $521 million in May. 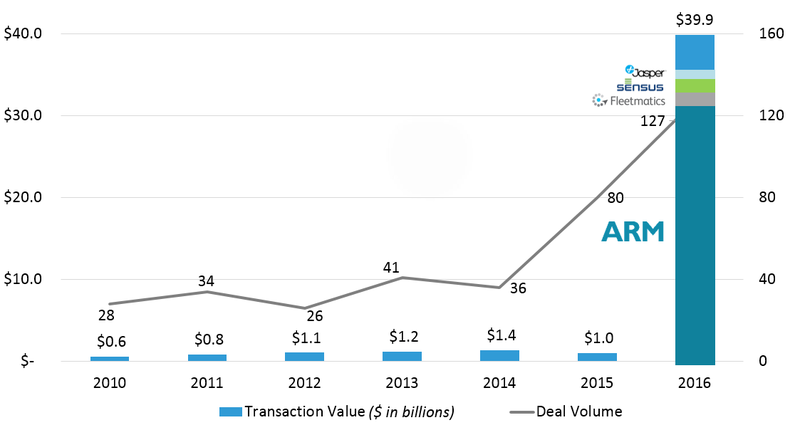 Furthermore, Sigfox, a French startup providing innovative IoT networking solutions, raised $115 million in 2015 and an additional $160 million in 2016 — it is now valued at $600 million. How often do your reevaluate your cloud service provider? No professional cloud services at yet but stories like this add more to the scare of jumping on the bandwagon.